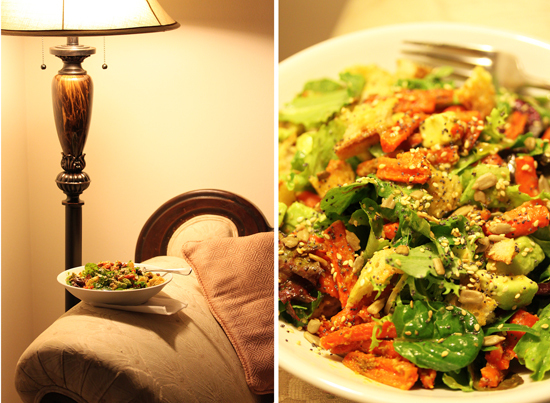 The full title of this post should be “Cumin, Garlic, Chile de Arbol, Thyme Roasted Carrots and Avocado Salad with Sour Dough Croutons, Roasted Orange and Lemon Dressing sprinkled with Sesame, Poppy and Sunflower Seeds.” Ok, so it’s a little long. It could have been even longer because I left out the Mesclun and Watercress. Also the olive oil and red wine vinegar. The carrots are par-boiled, coated with a paste made from cumin, garlic, arbol, fresh thyme, olive oil and red wind vinegar, and roasted with the oranges and lemons. I didn’t have anything, really, to say about this salad, except that it tastes fabulous and you should make it as soon as possible. So when there is no cute story and no fancy technique photos, what do you do? Well, I was going to tell you that the carrot is a root vegetable, usually orange, but it can also be white, yellow, red or purple. Its wild ancestors originated in Iran and Afghanistan and a few of its nearest relatives are parsley, fennel, dill and cumin. Only 3% of carrot’s beta-carotene is released when you eat it raw, but that is improved to 39% by pulping, cooking and adding cooking oil. And, very important, massive over-consumption of carrots can cause a benign condition called carotenosis in which the skin turns orange. However, I decided not to do that. Instead, I took all of my leftover salad ingredients that I had used the previous day for my beauty shots and dumped them all in a bowl. 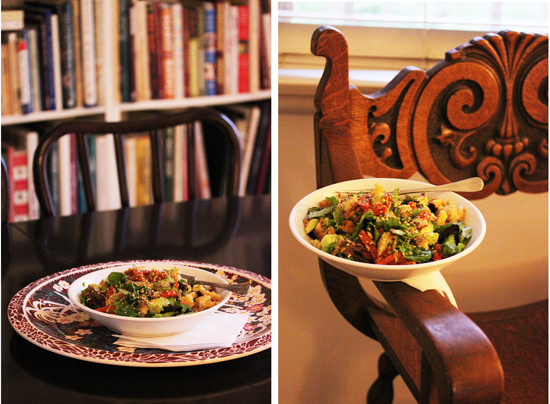 I sat down at my computer to write this post and realized how delicious my salad looked, so I decided to shoot my bowl at various locations around my house. Much more interesting than those dry carrot facts. The problem was that it was cloudy and rainy outside, and dim and sunless inside. Well, what the heck, I cranked my ISO up to 3200 and put my white balance on florescent, and let the pics fall as they may. Just pretend these photos look like they were taken in beautiful natural light falling blissfully through a south-facing window. Oh, and if, the next time I see you, your skin is orange, I will know what you have been doing. 1. Preheat the oven to 375 degrees F. Cover a sheet pan with aluminum foil. Bring a large pot of salted water to a boil. 2. Trim and peel carrots and cut each into 3-inch segments. Cut each segment lengthwise in half, or if larger, into pieces no larger than 3/4-inch wide. Add carrots to water, cover and simmer over moderately low heat until crisp-tender, about 10 minutes. Drain and transfer to prepared sheet pan. 3. In a large heavy mortar, crush cumin seeds with chile de arbol, ½ teaspoon Kosher salt and ¼ teaspoon pepper to a powder. Add garlic cloves and thyme leaves and pound to a paste. Stir in 2 tablespoons of olive oil and 2 tablespoons red wine vinegar. 4. Pour cumin dressing over carrots and toss to coat. Add orange and lemon halves to pan, cut side down. Roast for about 25 minutes, until carrots are tender. 5. Meanwhile, toast or grill the bread slices until edges are golden brown. Tear bread into bite-size pieces. 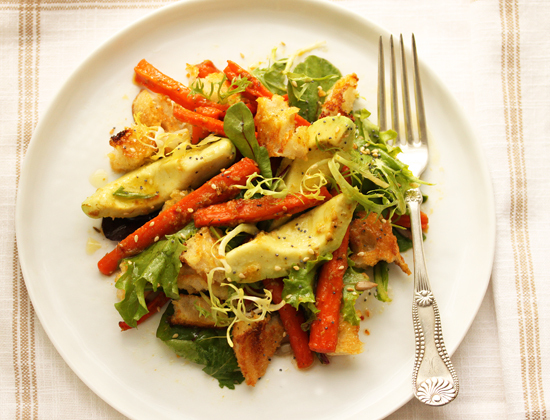 In a salad bowl, gently toss avocado wedges, salad greens and toasted croutons. 6. In a small sauté pan, toast sesame seeds until starting to brown. In a small bowl, combine sunflower, poppy and sesame seeds. 7. Using tongs, squeeze orange and lemon halves into a measuring cup until you have about 1/3 cup of juice. If less than 1/3 cup, add additional lemon juice. In a medium bowl, whisk the citrus juice with 1 tablespoon red wine vinegar and 1/3 cup olive oil. Season to taste with Kosher salt and black pepper. 8. 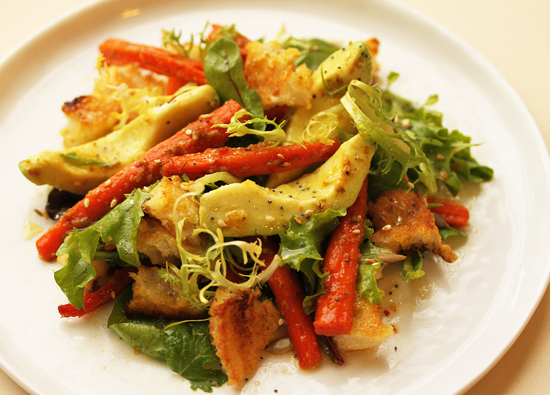 Add roasted carrots to salad bowl with avocado, greens and croutons. Drizzle citrus dressing over and toss to coat. 9. Transfer to salad plates and sprinkle with seed mixture. Serve. Boy, that pretty salad really gets around! I’m glad you didn’t share those dry carrot facts because I wouldn’t have wanted to learn that about the 39%. Always thought eating them raw was better for you. 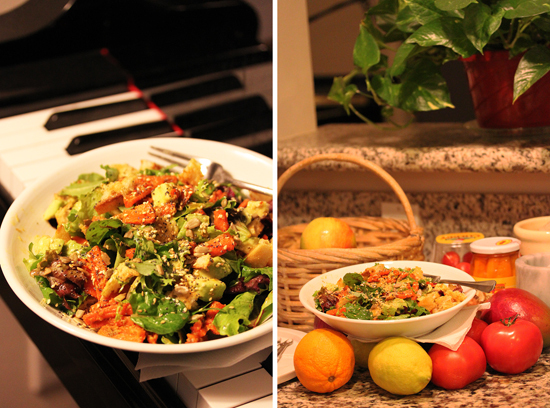 My favorite shot is the salad playing a ballad on the piano. Yummy !!! I know the winter photo problem and hate it BTW the WWII pilots were given lots of carrots (good for the eyes) and their skin tone would be orange. I have been making some of your recipes lately so this will be on my list soon Cumin is my favorite spice so anything with it makes me lick the plate. What a beautiful salad! 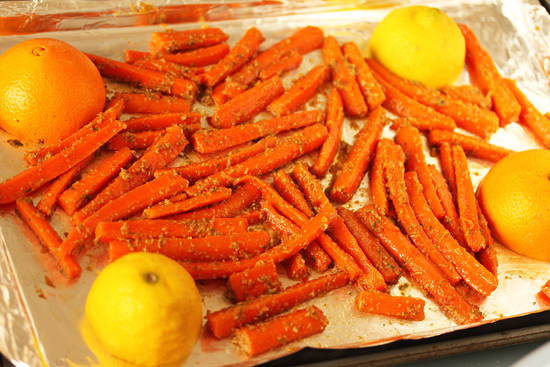 The spiced carrots are perfect and then no salad is complete without some toasted seeds! Definitely would make this a meal! Your descriptions make my mouth water and make me want to run out and make the dish. And I always get inspired when I see your beautiful photos. You are so funny! It is such a pain to try and shoot when it’s cloudy, but looks like your salad made the best of it Lovely flavors and oh so pretty!